South Sudanese Leadership Retreat - Diaspora Action Australia | Peace. Development. Human rights. Diaspora Action Australia had the great pleasure of supporting Victoria’s first ever South Sudanese Leadership Retreat, which explored how sub-communities can unite and work together as one community. The very successful three day event was led by the South Sudanese Unification Committee, comprising South Sudanese community leaders, and organised by DAA. The retreat agreed to establish a peak body that will officially represent the voices of all South Sudanese communities in Victoria, and promote human rights and development in South Sudan. Elections for the committee will be held across the state’s South Sudanese communities in March. The forum also agreed on a constitution for the peak body. 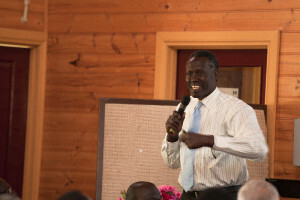 The retreat, which was held near Healesville, included representatives from approximately 60 South Sudanese sub-communities. Speakers and facilitators representing the Unification Committee, DAA, Victoria Police, Initiatives of Change Australia, Amnesty International and Victoria University discussed harmonious relations between the sub-communities, ethical leadership, peace-building, the role of women in leadership and the importance of maintaining unity in times of conflict. The retreat concluded with a keynote address by the Chairperson of the Victorian Multicultural Commission, Mr Chin Tan. It is hoped that once the peak body is successfully working in Victoria it can be used as a model for communities in other states.